While picturing your wedding, does the phrase "fairy tale" come to mind? Floral décor can up the magic in a variety of ways, from luxurious bouquets to dramatic arches to centerpieces that seem to have fallen out of a storybook. Flowers can bring your Pinterest board to a whole new level and leave guests stunned. Here are a few examples of fairy tale florals that will make your friends and family feel transported to Once Upon a Time. 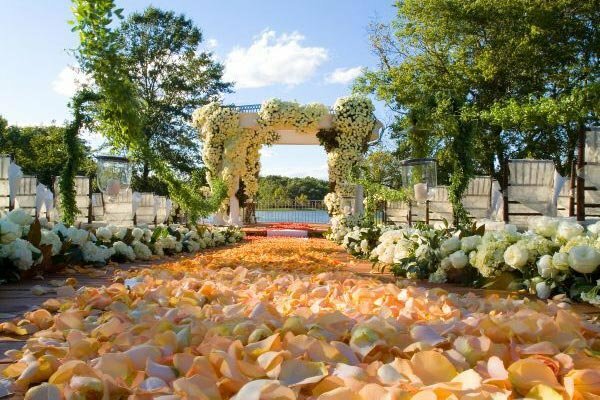 This gorgeous floral wedding aisle leads up to an elegant arch. Floral arches for the wedding aisle can make the entire ceremony feel like a fairy tale forest. Hanging floral pomanders add a unique touch. A floral ceremony arch brings romance to a stunning venue. Decorate the space above your aisle in beautiful sunset shades. Dress up a wedding arch with green leaves and orange roses. A suspended floral arrangement feels lovely and dramatic. Floral chandeliers add to a romantic atmosphere. Getting married near a pool or fountain? Add a floating floral monogram for something unexpected. Line your table with a beautiful ombré rose table runner. Draping greenery makes an outdoor wedding ceremony feel woodsy and intimate. A beautiful hanging flower arrangement can add serious drama to a fairy tale wedding. Taped flowers are a funky, floral touch. Baby's breath and white flower petals compliment each other perfectly on this multi-layered centerpiece. Eucalyptus with pops of red and pink make a dreamy table runner. Perfect for a vineyard wedding, mix a few bunches of green grapes into your floral centerpiece. This head table stands out with a cascading floral arrangement in rich, romantic colors. Garlands of roses add a beautiful pop to candelabras. This mossy tablescape feels like something out of Alice In Wonderland. Overflowing greenery can make an elegant centerpiece. A pretty pink tiered cake gets extra beautiful with added roses. Adorn a naked cake with jewel-toned flowers. Adding florals to your dessert can add an extra pop of fairy tale whimsy. Twigs and lilies make this wedding cake feel woodsy and romantic. Complete your look with a romantic pink and green flower crown. Encircle an updo with a pretty red ranunculus flower crown. Whimsical garden roses make this flower crown feel bohemian. Create a soft bouquet of pink roses and white hydrangeas. A lush bouquet with tulips, roses, and anemones is perfect for a springtime wedding. Complement a pink rose bouquet with soft violet stock. Cascading orchids add modern drama to this pale pink rose bouquet. Soft pinks, burgundies, and yellow billy balls give this bouquet a unique palette. Gold accents add visual interest to an oversized white rose bouquet. This whimsical bouquet looks like it was plucked from a fairy tale garden. Persimmons and fruit give this cascading bouquet a wintry feel. Peach roses and greenery make this romantic bouquet feel organic. Succulents give this fairy tale bouquet some unexpected texture. The dark purple and bright red hues add texture to this glamorous bouquet. Don't be afraid to add greenery to your bouquet! We love how the greenery fills out this loose bouquet of peonies and garden roses. Why choose just one color? We love this bold assortment of jewel-toned flowers. A sweeping stream of roses and succulents make the perfect cascade bouquet. The soft beige colors make this bouquet subtle and romantic. Peach roses and green succulents add to this lovely bouquet. Berry arrangements give this fall bouquet beautiful texture. Combine various flowers in shades of violet for a gorgeous look. Pink, orange, and purple-hued roses make this romantic bouquet look like a sunset. Combine lush peonies, garden roses, and eucalyptus in a dreamy bouquet. Billy balls add a colorful accent to this rustic wedding bouquet. Subdued colors stand out with a cascading bouquet. Cascading berries add an unexpected element to this jewel-toned rose bouquet.